Pun alert: We have some skin in the game! The start of the new Financial Year sees Creative Intersection taking an exciting new step and becoming an equal partner in the ApreSkin app. When we originally developed the ApreSkin app, alongside our client Dr Brad Jones (via his corporate innovation vehicle of 3D Medical Software Pty Ltd), we felt that the concept had such a huge potential that we couldn't help ourselves from investing our considerable resources to produce the best possible product. Wanting to improve their ability to bring innovative products to market, 3D Medical Software approached us with an equity deal that has seen us take a 50% stake in the ApreSkin product line. We are very much looking forward to guiding the technical development of ApreSkin, and already have a new public version of the app in the pipeline. 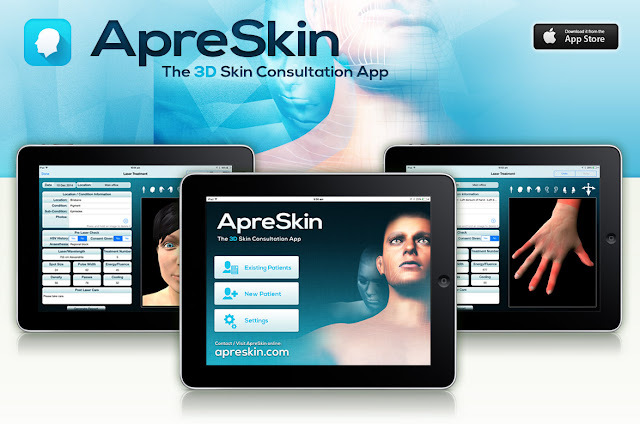 The "old" ApreSkin iPad app has been renamed to "ApreSkin MD" as we added a cutting-edge graphics engine for even better compatibility and performance. The new public-use app will be known as "ApreSkin you" and will initially be release for iPhone (with an Android version in the pipeline). Watch this space for its release in the next few weeks.